Many people make dive watches these days. 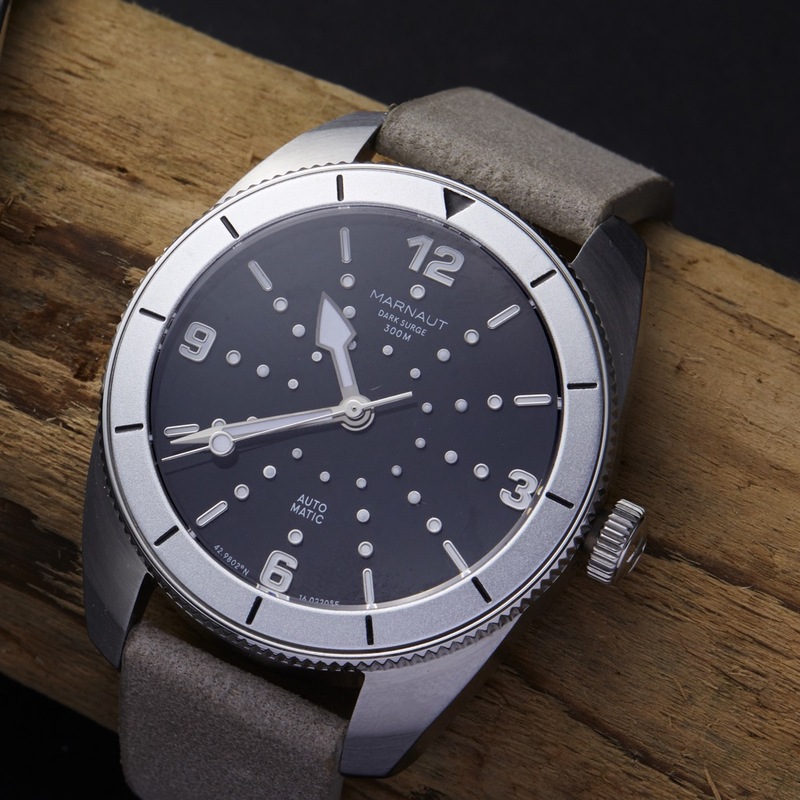 Not everyone expends the effort to think about what an explorer needs – what’s a non-dive watch meant for the hikes, climbs, and hills that life presents, while still looking sharp? And that’s what’s been done by Marnaut in their new watch named Dark Surge. It’s an automatic watch, 300M water resistant, with an intricate dial I’ll tell you more about in just a moment. Marnaut Dark Surge is a 42mm stainless steel watch. It has a 120-click bezel, but the insert has no numerals, so it’s not exactly proper to call it a diver. Instead, let’s call it an explorer’s watch that happens to be suitable for 300M depths. What makes this watch really sing to me are two things: One, the tasteful use of hands that pay homage to the Tudor Ranger, and two, an unbelievable 46 applied indices applied to an enamel-finished dial, treated with C3 SuperLuminova. I could tell you about how great it is that the Marnaut Dark Surge is powered by the thinner-than-ETA-2824 and accurate Miyota 9015. I could tell you how it’s got a lovely domed sapphire crystal. I could tell you that the bezel is fully lumed to match the indices on the dial and hands. I could even make a big deal about the enamel finish on the dial. All those things are important. Let’s get back to the star of the show. The dial. Seriously, 46 indices is work. They have to be applied by hand. Marnaut made this decision, knowing it would be extra labor that would never become easier in mass production. That’s either madness, or dedication, and I applaud it. Making glow like a star-field is no small undertaking, and the clever Croatians behind Marnaut should be applauded for it.